From Christina Rasmussen, the much beloved and acclaimed author of Second Firsts, comes a groundbreaking exploration of the afterlife that combines spirituality with cutting edge science—and reveals we all have the power to connect with our loved ones on the other side. “Where did you go?” This was the first question Christina Rasmussen asked after the death of her husband. A young widow with two daughters, Rasmussen would go on to become an esteemed grief educator who helped countless others rebuild their lives after loss. Yet, even as she learned to thrive again, that first heartbreaking question persisted. Even as she and her clients forged new paths and discovered new joy, the same questions remained: Are we capable of connecting to those who have passed on? What really happens after we die? As a professional grounded in science, Christina was a skeptic who shied away from the conventional mystical, supernatural, and religious descriptions of the afterlife—so she turned to what seemed “provable” to unravel the mystery of life beyond life: physics. What she found was beyond anything she could have expected: not only is there life after death, but we all have the ability to connect with loved ones who have passed on. Sharing an inspiring message of hope, optimism, and love, Where Did You Go? 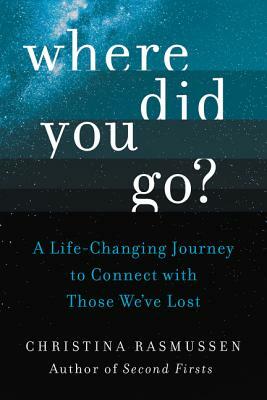 is a transporting step-by-step guide to journeying to the other side, from one of our most trusted voices on life after loss. Bridging the gap between the metaphysical and the measurable, it will change the way we grieve, the way we live and how we define our potential—in this life and the hereafter. Christina Rasmussen is an internationally recognized grief educator and author of Second Firsts. She is the founder of The Life Reentry Institute, Second Firsts, and Star Letters. Christina has been featured as a “Woman Working to Do Good” in the White House Blog. Her work has also appeared NPR, ABC News, and MariaShriver.com. She lives in Lafayette, California.